Our Service User Involvement group and Peer Mentoring Programme has now been running at SPEAR since 2016. All SPEAR clients from across our different services are invited to be part of the Service User Involvement Group. They are involved in many areas such as giving feedback on SPEAR’s services, volunteering and assisting at events and other activities. Our Service User Involvement Group ensures the voice of our clients is heard. In addition, through meeting others who have been through similar experiences to themselves, they can gain support and understanding and friendship too. Two of the three qualified Peer Mentors have now been employed by SPEAR. In addition, another SPEAR client (who was not on the Peer Mentor course) has been employed by SPEAR. 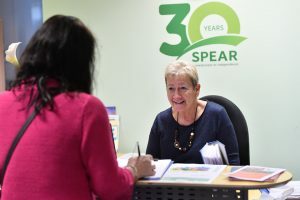 Having people who have experienced homelessness themselves employed at SPEAR, is something SPEAR continues to encourage and is part of SPEAR’s strategic aims. 5 of our Peer Mentors are now linked into one of the SPEARs staff teams, including Fundraising, Homeless Healthlink and Outreach. This means they benefit from hands on experience in a variety of roles from presenting and being an Ambassador at schools, colleges or community groups, to helping support clients. Being our 30th Anniversary year in 2017, we held a big client daytime event in June for our SPEAR clients to celebrate the transformation of lives. 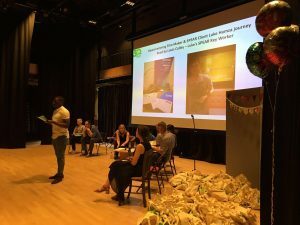 Around 70 clients attended this celebration which involved a singing workshop, wonderful buffet, complementary therapy treatments and a performance to the clients called ‘Spotlight on SPEAR’, ‘Homelessness on Film’ and ‘Celebrating SPEAR client success’. In the evening too we held an event for our supporters and volunteers with around 140 guests. Our clients played key roles; reading poetry, telling their story, showing their film and also helping back-stage and on the front of house. This was a special event involving Clients, Staff, Trustees Volunteers and also sponsors. 11 clients from our Service User Involvement group became qualified First Aiders (6 of these were Peer Mentors) and 5 of them were SPEAR clients from different services and hostels. Day trip to Kew Gardens and a day trip to Barnes Wetlands Centre. Rounders – playing against CGL – a local charity who also played with staff and service users. Rugby tournament – St George. This is SPEAR’s biggest annual fundraiser and SPEAR field a staff and SPEAR client team to play against the other corporate teams. Local fairs including Kew, Hands Fair – Twickenham, Barnes, Hampton Hill. Clients helped on the stall, gave leaflets out and talked to people about SPEAR. Ambassadors – giving presentations in schools and community groups. Service User Forum Involvement at St George’s Health Trust – SPEAR clients gave input into redeveloping services with an aim of improving them. They gave input. Partnership with Leonard Cheshire’s ‘Can Do’ partnership who donated SPEAR Christmas gifts and visited for the day with their service users too and together we wrapped presents and shared stories.